Greig Street 1913. Handwritten date: 6/13/13. Peanut vendor on left side. Several Rochester Ice Cream signs. The sender is Gladys Fuller (age 17) and is identified on the front with an x. She would marry and become Mrs. Gladys Fuller Lippincott. In a letter to the editor (1/19/1950 Sun and Record) she lived in Rochester and told how she missed her hometowns of Sodus and Sodus Point. She was born in 1896 and died in 1965. 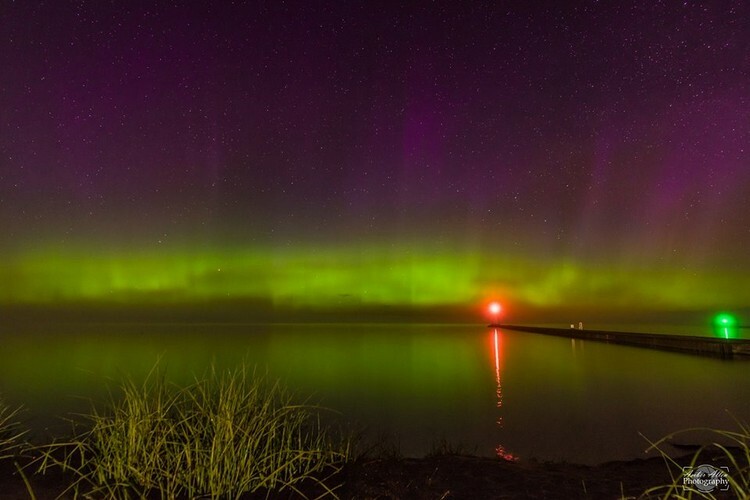 Occasionally on clear nights, you can see from Sodus Point, the Northern Lights glimmering like multi-colored drapes in the northern sky. Amber Allen took this photo on May 26, 2017 looking out past the pier light. For the next few weeks, Geraldo Rivera’s sailboat “Voyager” is being refurbished at Katlyn Marina. Doug Hazlitt has brought in another historic vessel. This time a beautiful 68 foot sailboat that Geraldo Rivera went around the world in. she always gave us smiles. Davina does it again; this time running 380 miles from Boston to Sodus Point! The Finale!Through 4 states, over the mountains, through the woods and in blistering heat, Davina finished unscathed…. For many years, Sodus Point has been a “destination” for visitors. This was also true for Hobos. Update as of 9/22/13: We had Ken Artl (who is a Mason specializing in Cobblestone House Restorations) examine the tunnel and take a number of mortar and pipe samples within the 20 foot tunnel. The mortar was chemically analyzed and found to be of the portland cement variety first used in this area no earlier than the early 1900s. The remnant of the 2.5 inch pipe found was wrapped in sheet type asbestos. Another interesting discovery was that the tunnel was constructed by first digging a ditch and then creating the arched tunnel and covering it up again.The conclusion from this analysis is that the tunnel was not used as part of the Underground Railroad movement. It was used to transport utilities to various sections of the house; probably piped water, and/or steam or later electricity. The Rochester and Sodus Bay Railroad ran trolleys from Rochester to Sodus Point from 1900 – 1929. The trolley was an important part of Sodus Point. Click the link below to learn more. 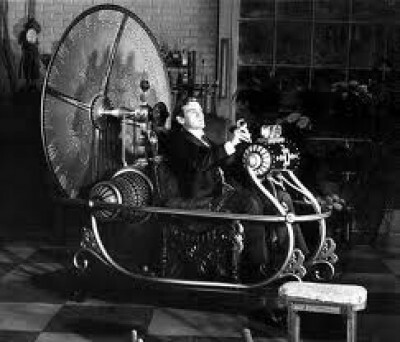 Come with me in my time machine as I walk arround Sodus Point in the early 1900s and narrate all the sights. Its a hopping place! I have added a narrated Sodus Point walking tour of 19th Century Architecture. You can view it by clicking on the Walking Tours on the top menu, then click on Narrated Sodus Point Walking Tour of 19th Century Archictecture. I have added a narrated Sodus Point walking tour of historic plaques and murals. You can view it by clicking on the Walking Tours on the top menu, then click on Narrated Sodus Point Walking Tour of Historic Plaques and Murals. I have added a story of the courageous African American women of Maxwell Settlement. You can view it by clicking on the Slavery tab on the top menu, then click on African Americans in Sodus then click on Courageous Women of Maxwell Settlement. I have added a link to a Chris Trine video showing the beauty of Sodus Point in January. You can view it by clicking on the The Beauty of Sodus Point tab on the top menu, then click on Sodus Point in January 2019 . I have added a video showing folks skating on the new ice rink that has recently opened at Willow Park. You can view it by clicking on the Recreation tab on the top menu, then click on Ice Skating on the New Ice Rink (2019) . I have added the story of Frank Monje who waterskied across the lake to Canada and back on a single waterski. You can view it by clicking on the Recreation tab on the top menu, then click on The Man who Waterskied across the Lake. I have added an old photo and write up of the Red and White Grocry Store from the 1930s. You can view it by clicking on the Old Photos tab on the top menu, then click on Businesses and then click on Red and White Grocery – 1930s. I have added an old 1950s photo looking over the bay from on top of the coal Trestle. You can view it by clicking on the Old Photos tab on the top menu, then click on Coal Trestle then click on Looking over the Bay. I have added an old photo showing the use of the boatswain chair taken from on top of the coal Trestle. You can view it by clicking on the Old Photos tab on the top menu, then click on Coal Trestle then click on Boatswain Chair. I have added an web page showing pictures and information on the Coal Ships that came to the Coal Trestle. You can view it by clicking on the Commerce tab on the top menu, then click on Railroad and Coal Trestle then click on Coal Ships. I have added an old photo taken on top of the coal Trestle. You can view it by clicking on the Old Photos tab on the top menu, then click on Coal Trestle then click on On top of the coal trestle. I have added an old photos of the Steuerwalds Silver Dollar and the Chase Family Coffee Shop from 1960,. You can view it by clicking on the Old Photos tab on the top menu, then click on Businesses and then click on Steuerwalds Silver Dollar 1960. I have added a number of old photos of the Rexall Drug Store from 1965. You can view it by clicking on the Old Photos tab on the top menu, then click on Rexall Drug Store – 1965. I have added an old postcard showing the Sodus Point beach second pier in 1906. You can view it by clicking on the Old Photos tab on the top menu, then click on Second Pier – 1906. I have added a 3 minute video of the past and present beauty of Sodus Point. You can view it by clicking on the The beauty of Sodus Point tab on the top menu, then click on Sodus Point – Somewhere in Time. I have added photos and information on Sodus Point’s first ambulance. You can read about it by clicking on the Old Photos tab on the top menu, then click on Fire Dept then click on First Ambulance – 1940. I have added photos and an article of the 1972 Bacorn Building Fire. You can read about it by clicking on the Old Photos tab on the top menu, then click on Bacorn Building Fire – February 1972. I have added a photo of smelting circa 1950s. You can read about it by clicking on the Old Photos tab on the top menu, then click on Smelting – 1950s. I have added a newspaper article about the fire that destroyed the Sodus Point Hotel. You can read about it by clicking on the Buildings tab on the top menu, then click on Hotels, then click on Sodus Point Hotel Fire. I have added an newspaper article from 1972 about the Fire Dept. acquiring the “Duck” . Click on the Old Photos tab on the top menu and then click the Sodus Point Fire Dept. “Duck” tab. I have added an 1974 map of Sodus Bay and the surrounding area with many annotated historic sites. Click on the Maps tab on the top menu and then click the 1974 Annotated Sodus Bay Map tab. I have added an 1810 map of Troupville. Click on the Maps tab on the top menu and then click the Troupville – 1810 tab. I have added the writeup for the proposed City of Sodus Bay that was never built. Click on the Artifacts tab on the top menu and then click the The City of Sodus Bay tab. 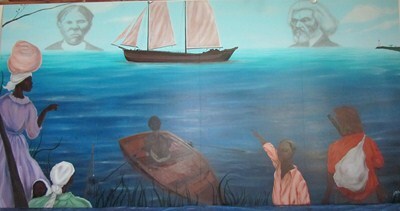 I have added pictures and the writeup for the new Historic Sodus Point Mural. Click on the Murals tab on the top menu and then click the Historic Sodus Point Mural tab. I have added a photo showing a locomotive pushing coal cars onto the trestle. You can read about it by clicking on the Old Photos tab on the top menu, then click on Coal Trestle, then click on Pushing Cars onto the Trestle. I have added a photo showing a Coal Ship loading at the Coal Trestle. You can read about it by clicking on the Old Photos tab on the top menu, then click on Coal Ship Loading at the Trestle. I have added a photo showing the Coal Trestle and the Road underneath it. You can read about it by clicking on the Old Photos tab on the top menu, then click on Coal Trestle and Road. I have added information about the the sad yet funny story of the Inner Pier Light. You can read about it by clicking on the Old Photos tab on the top menu, then click on Whatever Happened to the Inner Pier Light?. I have added a humorous article about George Helfer and his knitting. You can read it by clicking on the Quirky Stories tab on the top menu, then click on George Helfer. 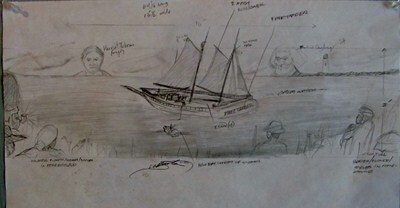 I have added an article about Captain Charles T. DoVille and the first boat livery in Sand Point. You can read it by clicking on the People tab on the top menu, then click on Captain Charles T. DoVille. I have added a link to early moring drone video taken at the lighthouse. You can watch it by clicking on the The Beauty of Sodus Point tab on the top menu, then click on Early Morning Lighthouse Drone Video. I have added a photo of The White Bakery. You can read all about it by clicking on the Old Photos tab on the top menu, then click on The White Bakery (1940s). I have added a newspaper clipping about rumors of the Coal Trestle to close. You can read all about it by clicking on the Other tab on the top menu, then click on the Coal Trestle to Close submenu. I have added a new section on the Railroad that never was. You can read all about it by clicking on the Commerce tab on the top menu, then click on the Railroad and Coal Trestle tab then click on the Railroad tab and then click on The Railroad That Never Was submenu. I have added a new section on the Beauty of Sodus Point dealing with the Northern Lights. You can read all about it by clicking on the Beauty of Sodus Point tab on the top menu, then click on the Northern Lights submenu. I have added a new section on the main menu for old photos. Under this new category I have added a photo on flooding from 1953. You can read all about it by clicking on the Old photos tab on the top menu, then click on the Flooding submenu. I have added the nineth letter between Colonel Peregrine Fitzhugh and Thomas Jefferson. You can read all about it by clicking on the People tab on the top menu, then click on the Colonel Peregrine Fitzhugh submenu then click on the Peregrine Fitzhugh Letters submenu and then click on the Jefferson Letters and finally click on Jefferson to Fitzhugh (Letter 9) . I have added the eighth letter between Colonel Peregrine Fitzhugh and Thomas Jefferson. You can read all about it by clicking on the People tab on the top menu, then click on the Colonel Peregrine Fitzhugh submenu then click on the Peregrine Fitzhugh Letters submenu and then click on the Jefferson Letters and finally click on Jefferson to Fitzhugh (Letter 8) . I have added the fifth letter between Colonel Peregrine Fitzhugh and Thomas Jefferson. You can read all about it by clicking on the People tab on the top menu, then click on the Colonel Peregrine Fitzhugh submenu then click on the Peregrine Fitzhugh Letters submenu and then click on the Jefferson Letters and finally click on Jefferson to Fitzhugh (Letter 5) . I have added the third letter between Colonel Peregrine Fitzhugh and Thomas Jefferson. You can read all about it by clicking on the People tab on the top menu, then click on the Colonel Peregrine Fitzhugh submenu then click on the Peregrine Fitzhugh Letters submenu and then click on the Jefferson Letters and finally click on Jefferson to Fitzhugh (Letter 3) . I have added the seventh letter between Colonel Peregrine Fitzhugh and Thomas Jefferson. You can read all about it by clicking on the People tab on the top menu, then click on the Colonel Peregrine Fitzhugh submenu then click on the Peregrine Fitzhugh Letters submenu and then click on the Jefferson Letters and finally click on Fitzhugh to Jefferson (Letter 7) . I have added the sixth letter between Colonel Peregrine Fitzhugh and Thomas Jefferson. You can read all about it by clicking on the People tab on the top menu, then click on the Colonel Peregrine Fitzhugh submenu then click on the Peregrine Fitzhugh Letters submenu and then click on the Jefferson Letters and finally click on Fitzhugh to Jefferson (Letter 6) . I have added the fourth letter between Colonel Peregrine Fitzhugh and Thomas Jefferson. You can read all about it by clicking on the People tab on the top menu, then click on the Colonel Peregrine Fitzhugh submenu then click on the Peregrine Fitzhugh Letters submenu and then click on the Jefferson Letters and finally click on Fitzhugh to Jefferson (Letter 4) . I have added a link to a web site that show the Town of Sodus deceased Veterans. The lists contain the Last and First Name, Cemetery where they are buried and the War they fought in pieces of Information. You can view it by clicking on the War & Battles tab on the top menu, then click on the Town of Sodus Deceased Veterans Lists tab. I have added a 26 minute presentation of the Quirky Stories and Characters of Sodus Point. You can view it by clicking on the Quirky Stories tab on the top menu, then click on the Ling Eaters and Other Strange Fish Presentation tab. I have added documentation of those men from Sodus Point who fought in the Civil War. You can view it by clicking on the War and Battles tab on the top menu, then click on the Civil War tab. I have added a short video of our last concert at the lighthouse for the 2016 season. You can view it by clicking on the The Beauty of Sodus Point tab on the top menu, then click on the Lighthouse Concert tab. I have added a photo and writeup on the Home Comfort Cottage. You can view it by clicking on the Buildings tab on the top menu, then click on the Houses , then click on the Home Comfort Cottage tab. I have added a video shot from a drone showing the Sodus Point fireworks of July 3 2016. You can view it by clicking on the The Beauty of Sodus Point tab on the top menu, then click on the Drone Fireworks July 3 2016 submenu. I have added a video showing the sky lanterns launch of July 4, 2015. You can view it by clicking on the The Beauty of Sodus Point tab on the top menu, then click on the Sky Lanterns Lauch – July 4 2015 submenu. I have added info, music and pictures of the Dolphin. You can view it by clicking on the Buildings tab on the top menu, then click on the Dolphin submenu. I have added info and a picture of Danny’s Superette. You can view it by clicking on the Sodus Point Memories tab on the top menu, then click on the Dannys Superette submenu. I have added a 30 minute presentation of the Underground Railroad in Local History. This 30 min. presentation tells how the “Freedom Seekers” got to our area. It also tells three documented stories of them coming to Sodus Point. It tells of the 2 ship captains who transported them to Canada onboard their ships and finally tells about the investigation into the rumored Underground RR tunnel in our village. You can view it by clicking on the Slavery tab on the top menu, then click on the Underground Railroad in Local History submenu. I have added our newest plaque about the Underground RR safe house at Maxwell Creek B&B Inn. You can view it by clicking on the Plaques tab on the top menu, then click on the Plaques submenu and then click Underground RR . submenu and then click on Arundell. submenu and then click on Maritime Occupations. submenu and then click on Rogers Ship Building. submenu and then click on Doville Ship Building. I have added a video recreation of the Sodus Point fog horn with the pier light in the background. You can read about it and watch it by clicking on the The Beauty of Sodus Point tab on the top menu, then click on the Fog Horn and Pier Light submenu. submenu and then click on Steamboats on Sodus Bay. submenu and then click on Vessels Built in our Area. I have added the first letter between Colonel Peregrine Fitzhugh and Thomas Jefferson. You can read all about it by clicking on the People tab on the top menu, then click on the Colonel Peregrine Fitzhugh submenu then click on the Peregrine Fitzhugh Letters submenu and then click on the Jefferson Letters and finally click on Fitzhugh to Jefferson (Letter 1) . I have added the fourth letter between Colonel Peregrine Fitzhugh and George Washington. You can read all about it by clicking on the People tab on the top menu, then click on the Colonel Peregrine Fitzhugh submenu then click on the Peregrine Fitzhugh Letters submenu and then click on the Washington Letters and finally click on Fitzhugh to Washington (Letter 4) . I have added the story of how it was planned to use 200 Turkish Angora Goats to clear Garfield (now Eagle) Island. You can read all about it by clicking on the Quirky Stories tab on the top menu, then click on the Turkish Goats of Garfield (Eagle) Island submenu. I have added the history of our the Salt Works School House. You can read all about it by clicking on the Buildings tab on the top menu, then click on the Schools submenu then click on Salt Works School House. I have added the history of our area mills. You can read all about it by clicking on the Commerce tab on the top menu, then click on the Area Mills submenu. I have added the history of our Fire Department that celebrated its 100 years of service in 2010. You can read all about it by clicking on the Other tab on the top menu, then click on the Firefighters – Our Hometown Heroes submenu. I have added the story of a French Fort on Sodus Bay in the early 1700s before our village was founded. You can read all about it by clicking on the Other tab on the top menu, then click on the French Fort on Sodus Bay? submenu. I have added a story about the 1986 Powerboat Race here in Sodus Point. You can read all about it by clicking on the Recreation tab on the top menu, then click on the 1986 Powerboat Race off of Sodus Point submenu. I have added a quirky story about the first meeting in our town. You can read all about it by clicking on the Quirky Stories tab on the top menu, then click on the First Meeting in our Town submenu. I have added a story about the migrant workers in our area in the 1940s and 50s. You can read all about it by clicking on the Sodus Point Memories tab on the top menu, then click on the Migrant Workers submenu. I have added a story about the human side of our German POWS kept here in Sodus Point. You can read all about it by clicking on the Wars & Battles tab on the top menu, then click on the POW – The Human Side submenu. I have added a story about tobogganing in the 1940s and 50s. You can read all about it by clicking on the Recreation tab on the top menu, then click on the Tobagganing submenu. I have added a video showing kitesurfing at our beach. You can read all about it by clicking on the Recreation tab on the top menu, then click on the Kitesurfing submenu. I have added the story of Secretary of State John Foster Dulles visiting Sodus Point. You can read all about it by clicking on the Other tab on the top menu, then click on the Secretary of State Foster Dulles submenu. I have added the story of swimming the channel. A Sodus Point “rite of passage” in the 1940s and 50s. You can read all about it by clicking on the Sodus Point Memories tab on the top menu, then click on the Swimming the Channel submenu. I have added another quirky story. This time about Whiskey Jim. You can read all about it by clicking on the Quirky Stories tab on the top menu, then click on the Whiskey Jim submenu. I have added the story of the Murder of Jim Hall. You can read all about it by clicking on the Quirky Stories tab on the top menu, then click on the The Murder of Jim Hall submenu. I have added the history of Katlynn Marine. You can read all about it by clicking on the Recreation tab on the top menu, then click on the Boat Marinas submenu and then click Katlynn Marine . I have added information about the Bayshore Amusement Park. You can read all about it by clicking on the Recreation tab on the top menu, then click on the Bayshore Amusement Park submenu. I have added information about The lotus flowers in Sodus Bay. You can read all about it by clicking on the Other tab on the top menu, then click on the Lotus Flowers in Sodus Bay submenu. I have added information about DoVille’s Ice Cream Stand and their wonderful home made cones. 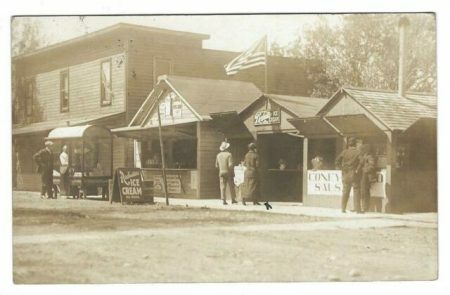 You can read all about it by clicking on the Sodus Point Memories tab on the top menu, then click on the Mrs. DoVille’s Ice Cream Cones submenu. I have added the beginning Introduction to recently discovered letters between Colonel Peregrine Fitzhugh and George Washington and Thomas Jefferson. You can read all about it by clicking on the People tab on the top menu, then click on the Colonel Peregrine Fitzhugh submenu then click on the Peregrine Fitzhugh Letters submenu and then click on the Peregrine Fitzhugh Letters (Introduction) . I have added rare video footage of a Coal Ship coming into Sodus Bay. You can read all about it by clicking on the Other tab on the top menu, then click on the Coal Ship Coming into the Bay submenu. I have added info on the Iron Ore Dock. You can read all about it by clicking on the Commerce tab on the top menu, then click on the Iron Ore Dock submenu. I have added The History of Eagle Island. You can read all about it by clicking on the Other tab on the top menu, then click on the History of Eagle Island submenu. I have added info about our Railroad Yard. You can read it by clicking on the Commerce tab on the top menu, then click on the Railroad And Coal Trestle submenu and then click on Railroad and then Railroad Yard. I have added a Wayne County Times article about Henry Zerbe. You can read it by clicking on the Commerce tab on the top menu, then click on the Railroad And Coal Trestle submenu and then click on Henry Zerbe. I have added information about the Railroad Roundhouse. You can read all about it by clicking on the Buildings tab on the top menu, then click on the Railroad submenu and then click on Railroad Roundhouse. I have added information about the Railroad Y restaurant and the railroad bunk house. You can read all about it by clicking on the Buildings tab on the top menu, then click on the Railroad submenu and then click on Railroad Y And Bunk house. I have added information about the names of the islands in Sodus Bay. You can read all about it by clicking on the Other tab on the top menu, then click on the Islands in Sodus Bay submenu. I have added information about what we think we know about Native Americans in Sodus Bay. You can read all about it by clicking on the Other tab on the top menu, then click on the Native Americans in Sodus Bay submenu. I have added information about Sodus Bay Heights and the King of France. You can read all about it by clicking on the Other tab on the top menu, then click on the Sodus Bay Heights & the King of France submenu. I have added another Quirky Story about the curious case of the No Name Cheese. To read about this simply click on the Quirky Stories tab on the top menu, then click on the No Name Cheese submenu. I have added another Quirky Story about Ling Eaters. Ling Eaters was a derogatory name for those who lived in Sodus Point. To read about this title simply click on the Quirky Stories tab on the top menu, then click on the Ling Eaters submenu. I have added another Quirky Story about Old Tom. Old Tom was a beloved character who graced our town from the 1920s through the 1940s. Simply click on the Quirky Stories tab on the top menu, then click on the Old Tom submenu. I have added information about the contributions made by African American in Sodus and the surrounding area. You can read all about it by clicking on the Slavery tab on the top menu, then click on the African Americans in Sodus submenu. I have added information about Taxi Dancing in Sodus Point. You can read all about it by clicking on the Recreation tab on the top menu, then click on the Taxi Dancing submenu. I have added images and the write up of the new Town of Sodus Mural with scenes representing the 5 hamlets and 2 villages (including Sodus Point) within the Township of Sodus. You can see the new mural and read about each scene by clicking on the Murals tab on the top menu, then click on the Town of Sodus Mural submenu. Dedication of this new mural will take place on Sunday, August 09 at 2 PM at the corner of Maple and Main Streets in Sodus. I have added another Quirky Story about The Piano in the Back of the Truck . Yes you read that right. You can’t make this stuff up. Simply click on the Quirky Stories tab on the top menu, then click on the The Piano in the Back of the Truck submenu. 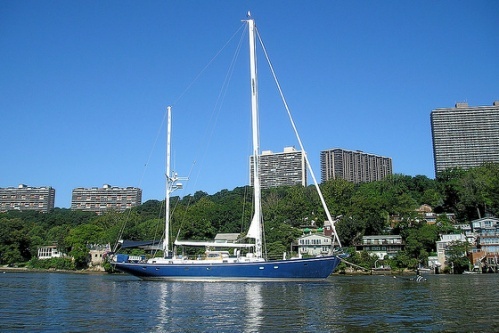 I have added a new post about Geraldo Rivera’s sailboat Voyager that is at Katlyn Marina for refurbishing. Scroll to the right in the scroll bar with the small images on it on the home page until you see Voyager’s image and then click on it. Read the story of this beautiful sailboat. I have added another Quirky Story about Billy Boomerang. Billy was a local boy who became a world champion boomerang thrower and achieved legendary status on Padre Island. Simply click on the Quirky Stories tab on the top menu, then click on the Billy Boomerang submenu. I have added Wickham’ s Marine list for the year 1817. In Wickam’s Marine List, Captain William Wickham tracked ships coming into and leaving Troupville (later to be renamed Sodus Point). In his write up, he identified the type of vessel (usually a schooner), its name, its Captain’s name, its cargo and where it was heading. To read all about it, click on the Commerce tab on the top menu, then click on the Schooners and Steamboats submenu and then click Wickhams Marine List. 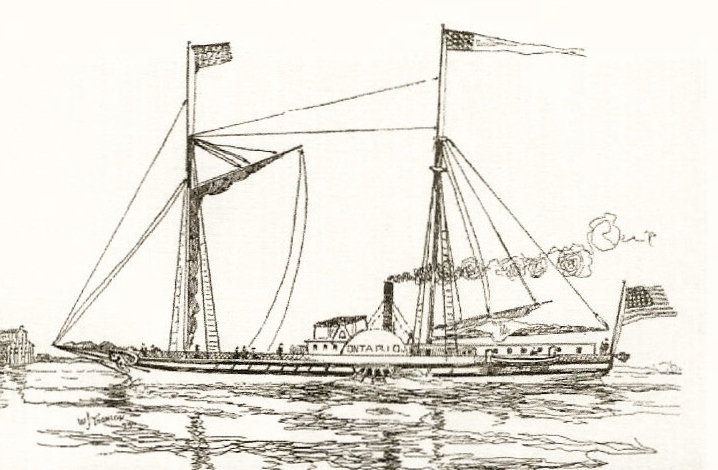 We have just recently discovered that the first steamboat in regular service on the Great Lakes stopped in Troupville (later to be renamed Sodus Point) on its maiden voyage on April 25, 1817 commanded by Captain Malaby. To read all about it, click on the Commerce tab on the top menu, then click on the Schooners and Steamboats submenu and then click Steamboat Ontario at Troupville. I have added information about the Hobos camp that was in Sodus Point in the 1940s and 1950s. Click on the People tab on the top menu, then click on the Hobos in Sodus Point submenu. I have added how about 40% of downtown Sodus Point was reclaimed from Lake Ontario. Click on the Commerce tab on the top menu, then click on the The Building of Sodus Point submenu. I have added another Quirky Story about the horse that drank beer. Simply click on the Quirky Stories tab on the top menu, then click on the The Horse That Drank Beer submenu. I have added another Quirky Story about how Christian Holler Road got its name. Simply click on the Quirky Stories tab on the top menu, then click on the Christian Holler submenu. I have added another Quirky Story about humor during the Battle of Sodus Point. Simply click on the Quirky Stories tab on the top menu, then click on the Humor during the Battle of Sodus Point submenu. I have added a new section that tells some of the Quirky Stories of Sodus Point. Leading off is the story of the day a Swordfish (what!?!) was caught in Sodus Bay. Simply click on the Quirky Stories tab on the top menu, then click on the Swordfish Caught in Sodus Bay submenu. I have added information about the Sodus Bay Heights Golf Club. The information includes a link to its history and a Sirius Radio broadcast about Robert Trent Jones, Sr. (who was our first golf pro) at our golf club. Simply click on the Buildings tab on the top menu, then click on the Clubs submenu and then click on the Sodus Bay Heights Golf Club submenu. I have added information about the Sodus Bay Yacht Club. The information includes a link to its history and a youtube video that contains spectacular footage of the Yacht Club and Sodus Bay that was shot from a remote controlled drone. Simply click on the Buildings tab on the top menu, then click on the Clubs submenu and then click on the Sodus Bay Yacht Club submenu. I have added a picture and information about the Sodus Bay Social Club (circa 1920 – 1930). Simply click on the Sodus Point Memories tab on the top menu and then click on the Sodus Bay Social Club submenu. I have updated the upcoming historic events section for 2015. Simply click on Upcoming Historic Events on the top menu. I have added a picture of Go Kart Racing on Sodus Bay (circa 1968 – 1971). Simply click on the Sodus Point Memories tab on the top menu and then click on the Go Kart Racing on Sodus Bay submenu. I have added a timeline main menu option so you can search about major historical stories of Sodus Point in a chronological manner. Simply click on the Timeline tab on the top menu and then click on which ever submenu gets you to the to the timeframe you are interested in. I have added a three page article about the dedication ceremony written in 1927 of the Asher Warner and 1812 Peace Garden Plaques by the Daughters of 1812. Read all about it by clicking on the Plaques tab on the top menu and then click either the 1812 Peace Garden Plaque submenu or the Asher Warner Plaque submenu. The links to the article are on the bottom of the page. I have added the folklore tale of the British Pay Ship that is said to haunt our Bay. Read all about it by clicking on the Sodus Point Memories tab on the top menu and then click the Myths and Folklore submenu and then click the British Pay Ship submenu. I have added an aerial photograph (and information) of Greig Street in 1965 showing the Dolphin, roller skate rink, etc. Read all about it by clicking on the Sodus Point Memories tab on the top menu and then click the Sodus Point 1965 submenu. I have added information about the Guild Hall that we now know as the Village Offices. Read all about it by clicking on the Buildings tab on the top menu and then click the Guild Hall submenu. I have added information about the Sands Point Amusement Park that existed in the 1950s where the beach park now is. Read all about it by clicking on the Memories tab on the top menu and then click the Sands Point Amusement Park submenu. I have added to the information on E.H. Harriman an article that Arch Merrill wrote about him for the Sunday, September 19, 1954 edition of the Rochester Democrat and Chronicle. . Read all about it by clicking on the People tab on the top menu and then click the E.H. Harriman submenu. I have updated the Upcoming Historic Events section. On Sunday, August 3, we will be doing guided Trolley Rides from Sodus Point to Sodus on “Molly the Trolley” a recreation of a vintage trolley car. Read all about it by clicking on the Upcoming Historic Events tab on the top menu.. I have added information on the new Seaways Trail Interpretive Panel that will be installed at the Lighthouse this spring. Read all about it by clicking the Plaques tab on the top menu, then click Intrepretive Panels on the sub menu, then click SEAWAY Trails War of 1812 BRITISH RAIDS. I have greatly expanded the information about the coal trestle by adding the 1972 Hoffman paper ” A History of the Coal Trestle at Sodus Point” by Susan Yancey VanAcker. I have also added a sound track of a coal shaker so people who never heard it get an idea what it sounded like and for those that did to bring back old memories. Read all about it by clicking the Commerce tab on the top menu, then click Coal Trestle on the sub menu. I have added the story of the tragic train wreck that occurred in 1901. The train had left Sodus Point and a number of Sodus Point residents were killed or injured in the wreck. Read all about this sad story by clicking the Commerce tab on the top menu, then click Railroad on the sub menu and then click Tragic Train Wreck. I have updated the Sodus Point Lakers info in the Memories section. I interviewed Ken Johnson and Don Johnson of the Sodus Point Chiefs and added some of their fond memories of playing on Sodus Point’s semi pro baseball team in the early 1950s. Click the Memories tab on the top menu, then click Sodus Point Lakers. Seasons Greeting to all. The newly erected trolley pole in Willow Park has been decorated for Christmas! We have added a video Christmas card featuring the Trolley Pole and its new song! View it by clicking the decorated trolley pole on the slider bar. Have a Jolly Trolley Christmas! I have added a poster that’s has an artistic rendition and tells the story of the Sodus Pt. Fish & Crab House, Inc. It also includes the brief history of Joe’s Place, The Dolphin and Captain Kelley’s restaurants that were formerly at the same location. Read all about it by clicking the Commerce tab on the top menu, then click Sodus Pt. Fish & Crab House on the sub menu. I have added a photo of the new Trolley Pole and its plaque with the write up that is on the plaque. Read all about it by clicking the Plaques tab on the top menu, then click Plaques on the sub menu and then click Trolley. What was Prohibition like in our village? Read all about it by clicking the Memories tab on the top menu, then click Prohibition. Did you know that Sodus Bay is only one of twelve places in New York State where mail is delivered by boat? Read all about it by clicking the Commerce tab on the top menu, then click Boat Mail Delivery On Sodus Bay. This summer history was made in a way many in Sodus Point would have preferred not to have happened. Our village was hit by a very severe summer storm packing winds of 70 MPH. Read all about it by clicking the Memories tab on the top menu, then click Summer Storms – 2013. How did the fugitive slaves get to Sodus Point? I have created a fictional account of one family’s long road to freedom from South Carolina to Sodus Point based on historical facts. Click the Slavery tab on the top menu, then click How the Freedom Seekers got to Sodus Point . Stop the presses!!! New information and evidence has come about the Sodus Point Slave Tunnels thanks to Ground Penetrating Radar. Read all about it. Click on the Sodus Point Tunnel Revealed? thumbnail on the slider bar or click the Slavery tab on the top menu, then click Sodus Point Tunnel tab and then click The Sodus Point Tunnel Revealed? . To commemorate the upcoming 200th anniversary of the Battle of Sodus Point, I have created a music video. Click the War & Battles tab on the top menu, then click Battle of Sodus Point (The Music Video) . I have added an article that lists the names of all of the Sailors from Sodus Point from approximately 1854 – 1914. Click the Commerce tab on the top menu, then click Sodus Point Sailors 1854 – 1914 . I have added information about the British soldiers killed in the Battle of Sodus Point. This includes name, rank, regiment, previous occupation, etc. Click the War & Battles tab on the top menu, then click Battle of Sodus Point War of 1812 (THE MEN). I have also added additional information about trolleys. This includes pictures of one of the few functioning trolleys from the 1920s that happens to be in Rochester, NY. which you can still ride on. I also answer questions such as how many people did it take to run the trolley and how did it reverse direction. Click the Commerce tab on the top menu, then click Trolley. I have added Sodus Point Lakers to the Memories section. George Arney relates his story of playing on Sodus Point’s semi pro baseball team in the 1940s to the 1950s. Click the Memories tab on the top menu, then click Sodus Point Lakers. I have added Fish Pirates to the Memories section. Deborah Hopkins researched the little known episode in Sodus Point history around 1900. Click the Memories tab on the top menu, then click Fish Pirates. I have added Santiago de Sodus Point to the Memories section. Deborah Hopkins talks about her ancestor Benjamin Hopkins and the very unique tree house motel he made around 1900. Click the Memories tab on the top menu, then click Santiago de Sodus Point. I have added Deborah Hopkins to the Memories section. She talks about the Hopkins and DoVille familes in Sodus Point. Click the Memories tab on the top menu, then click Deborah Hopkins. I have also added a biography of Henry DoVille, Sr.. Click the People tab on the top menu, then click Henry Doville, Sr. . I have added a new item to the top menu: Memories In this section I will add people’s recollections of Sodus Point from bygone days. The first one is Doug Stark who visited Sodus Point in the 50s and 60s. Click the Memories tab on the top menu, then click Doug Stark. I have added three new items to the top menu: Links, Contact Us and Upcoming Historic Events. I have added information about how to view or print our new Self Guided Tour Brochure of Historic Sodus Point or where you can pick one up in town. Click the Walking Tours tab on the top menu, then click Self Guided Tour Brochure of Historic Sodus Point. I have added information about the new Robert Trent Jones, Sr. plaque. Click the Plaques tab on the top menu, then click the plaques sub menu and then click Robert Trent Jones, Sr. I have also updated the walking tour map to reflect this new plaque. I have added information about the trolley in Sodus Point. Click the Commerce tab on the top menu then click Trolley. You can also get to it by clicking the small slider image of the trolley. November 21, 2012 – I have added pictures and the writeup for the new coal trestle plaque. Click on the Plaques tab on the top menu and then click the Coal Trestle Plaque tab. October 3, 2012 – Ever wish you could go back in time to see what Sodus Point was like in the early 1900s? I have created a simulated trip back. Join me as I walk around Sodus Point and see this exciting time in our town’s history. Click on the Walking Tours tab on the top menu and then click the Guided Tour of Sodus Point in the Early 1900s tab. September 11, 2012 – Thanks to a great deal of work by my wife, I have added a section about the 1896 Methodist Church Signature Quilt. It has over 350 names on it; a who’s who of Sodus Point in the 19th century! Click on the Artifacts tab on the top menu and then click the 1896 Signature Quilt tab. 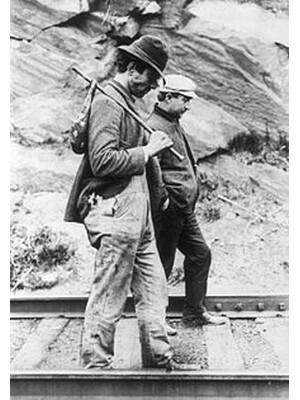 September 2, 2012 – I have added additional information about Sodus Points involvement in the Underground Railroad. Click on the Slaves tab on the top menu and then click the More Underground Railroad in Sodus Point tab. August 24, 2012 – I have added the new War of 1812 Peace Garden Interpretive Panel. Click on the Plaques tab on the top meu and then click the War of 1812 Peace Garden Interpretive Panel tab. This has also been added to the Walking Tour of Sodus Point. July 31, 2012 – I have added three poems dealing with the Underground Railroad in Sodus Point. Click the Slavery tab on the top menu and then click the Underground Railroad Poems tab. July 20, 2012 – We have added information about famous celebrities that lived in Sodus Point. Click the People tab on the top menu then click Celebrities. July 14, 2012 – We have added the interesting story of the 1175 foot tunnel in Sodus Point which may have been used to hide and transport runaway slaves. Its under the Slavery tab on the top menu. July 6, 2012 – We have added a Feb. 1st , 2009 Rochester Democrat and Chronicle story about the Newport Family which is believed to be the first free black family in Sodus Point. It is under the Slavery tab on the top menu. June 21st – The finished Mural! It will be hung on the firehall on Thursday, 6/28/12 and mural dedication will be Saturday July 14 th at 1 PM. April 11, 2012: With my wife’s help, we are beginning to add information about the many historic buildings in Sodus Point. More information about these buildings can be found on the top menu under “Buildings” .